Cream of tartar is a magical ingredient that you will encounter in the kitchen. It’s not very common which is why some people might not have an idea about what it really is. You might see it in your friend’s kitchen or in a recipe and wonder what it does to the food. But even though it’s not very common and some people might not even have an idea about this powdered ingredient, it’s still very useful to know what it does. Just like every other ingredient, cream of tartar can help you experiment, create, and even improve your recipes. Contrary to how it is called, cream of tartar is not a creamy ingredient at all. Yes, that might be confusing, especially for those who are just starting to learn how to cook and explore around the kitchen. Instead, cream of tartar is a white powder. It is produced after grapes is fermented into wine. It’s basically what’s left after you drain a wine barrel. Another fun fact to know is that it’s tartaric acid. Some people use this ingredient as a leavener because of how it reacts when combined with baking soda. These two products create carbon dioxide gas which is also achieved when you use yeast in making breads. Meanwhile, when cream of tartar is mixed with egg whites, it stabilizes the bubbles. This means that when you whisk your egg whites, the bubbles won’t deflate as quickly, giving you the perfect volume and consistency. Cream of tartar is commonly used in meringue cookies, meringue pies, and angel food cakes. It makes these baked goodies look more dainty and have that perfect foam. But what most people probably don’t know is that cream of tartar can also be used to keep some vegetables looking fresh. The pigments of potatoes, red cabbage, and even cauliflower tend to leach out when they are boiled or steamed. If you want to maintain these vegetables’ bright colors, just add ½ teaspoon of cream of tartar to the water, and let this ingredient do its magic. How to choose the right substitute? Aside from being useful in the kitchen, cream of tartar can also be used as a household cleaner. All you have to do is to add water until you have a paste, and then you can finally use it for polishing metal. It can also be an all-purpose scrub when you mix it with white vinegar. Since cream of tartar is sold in larger amounts than you might need, there is a big chance that you will have some left over. When this happens, you’ll have to store it. However, this ingredient is not often used in recipes, which might force you to store it at the back of your pantry. But when a recipe finally calls for it again, how do you know if it’s still okay to use for your recipe? One of the various ways to check if your cream of tartar is still good to use is by inspecting the can or jar that you are using to store it. Make sure that there are no leaks, cracks, rust, or any kind of damage that could’ve led to contamination. The next step is to open the can and check the content itself. Are there any visible signs of moisture? Do you see any marks of liquid that might have dripped in the powder? If you see any of these in your cream of tartar, then just throw it away and get a new one. You don’t want to ruin your food or risk using a contaminated ingredient, right? That would be a waste of your resources. However, if you’re still uncertain about your cream of tartar after checking your can and the content, there is another way to know if it will still work for your recipe. Testing the potency of this ingredient is pretty easy. You just have to get ½ cup of warm water, put ½ teaspoon of cream of tartar, and finally, a pinch of baking soda. If the mixture reacts strongly and becomes foamy, this means that you can still use it and that it will still have the same reaction in your recipe. While cream of tartar is very easy to use in the supermarket, there are times when we just don’t have it in the kitchen and going back to the supermarket to buy this small ingredient can be a hassle. But you don’t have to worry because cream of tartar substitutes will help you with your problem. Here are some of them. As mentioned above, cream of tartar is also used side by side with baking soda. It’s an effective leavener, which is why you might encounter it in some of your baking recipes. But if you don’t have some cream of tartar on hand, white vinegar will do the job. Some people might be surprised about this because vinegar has a really strong smell and taste that it doesn’t seem to fit with baked goods. But what you should also know is that vinegar is an acid that reacts with baking soda so that the carbon dioxide needed to lift the batter is produced. Therefore, it is a great cream of tartar substitute. While there are different kinds of vinegar that you can use when baking, the most common is white vinegar and apple cider. White vinegar is a very convenient option since most people have this in their kitchen. It’s a popular ingredient because a lot of savory dishes call for it. 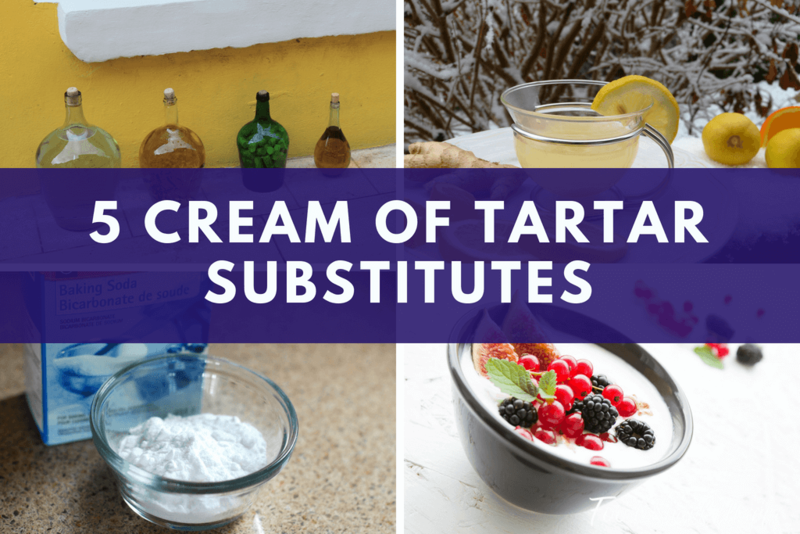 If you run out of cream of tartar, this substitute would probably be the first thing that you’ll think of. However, it is not recommendable to use this substitute when you’re making cakes unless the recipe stated that you use it as a leavener. This is due to the strong flavor of white vinegar which might make your cake taste different. But if you’re just thinking of using it for your egg whites, then it’s a great candidate! To use white vinegar as a substitute, simply put the same amount as you would when for cream of tartar. But if the recipe indicated a specific amount of white vinegar, then just follow the instructions. Aside from vinegar, lemon juice is a substitute that it is also very easy to find. You probably have lemons stored in your kitchen because you use it to make healthy fruit juices, to cook savory dishes, or even for your skin regimens. Lemon can be used in lots of ways at home, and one of them is when you’re baking and you ran out of cream of tartar. Just like the other substitutes, lemon is very acidic which makes it one of the best substitutes. It actually has the same level of acidity as cream of tartar! The lemon’s acidity is especially perfect when you’re trying to make stiff peaks by whipping your egg whites. This substitute will work as great as the cream of tartar. Substituting is also easy because you just have to use the same amount as the recipe indicated for cream of tartar. Now that you’ve discovered one additional use of lemon in your house, you have another reason to store some in your kitchen. However, one challenge that you will encounter when using lemon is how to store them properly. The best way to keep your lemons fresh is by putting them in a ziplock bag and keeping them inside the refrigerator. This will avoid them from losing moisture. Your lemons will last longer which is a great thing especially if you’re buying in bulk. Unlike cream of tartar, baking powder is not a very unusual ingredient. You’ll see it in almost every pantry especially for those who love to bake. But these two ingredients also have some similarities. First of all, both of them are acidic, and second is that they’re both in powder form. What makes the baking powder a special cream of tartar substitute is because it’s basically made of baking soda and cream of tartar! If you are not familiar with how baking powder works, here’s a quick rundown. Baking powder reacts when water is added to it, creating carbon dioxide that gets trapped in your batter. Once you put your dough or batter inside the oven, the heat will cause the mixture to release carbon monoxide that expands the gases and helps the batter to rise. Because cream of tartar and baking powder has a lot of similarities with each other, you can use them interchangeably. You can substitute baking powder with cream of tartar as well. However, you have to keep in mind that baking powder will only work as a substitute for recipes that have both cream of tartar and baking soda in it. Baking powder is not a good substitute if the recipe only requires cream of tartar like when you’re trying to stabilize your egg whites for meringue. Yogurt is another acidic ingredient that can substitute for your cream of tartar. This product is created after fresh milk goes through the fermentation process and good bacteria is added to it. It’s very nutritious and it has a sour flavor that everyone loves. Your child or a family member probably loves this as a snack. But what if you have too much yogurt? How do you store it so that it won’t get spoiled and you’ll still enjoy it for a long time? There are several ways to store your yogurt so you can still eat it or use it in many ways, including baking. The first one, avoid eating straight out of the container or the pot where all of your yogurt is stored to prevent cross-contamination. Instead, scoop the amount that you need or want to eat using a clean spoon, and put it in the smaller bowl. Second, is to put your yogurt in a clean and airtight container. Food with bad odor can contaminate your yogurt as well especially if you put them in the same fridge. Which is why sealing it is very important. And lastly, freezing your yogurt will definitely help it last longer. It can last up to 1 month if kept inside the fridge and protected from any kind of contamination. However, take note that freezing your yogurt will change its texture, which is not that good if you’re planning on eating eat. But for those who are planning on using the yogurt for baking, this should be perfect. Another good news is if ever you don’t have a cream of tartar on hand, but you have a yogurt in your fridge, you can still save your recipe by using it as a substitute. How do you do it? Just add small amounts of milk to the yogurt so that it has a thin consistency like buttermilk has. Use it as a cream of tartar substitute in your recipe but don’t forget that you have to reduce the amount of your liquid ingredients since this is in liquid form as well. After churning and producing butter, the liquid that is left is called buttermilk. It has a rich flavor and can be used for a lot of baking recipes. You can find this product everywhere but you can also make your own if you want to experiment or you don’t have time to go out. Buttermilk is also very easy to store. Since it’s a kind of cultured milk like yogurt, you can freeze it still use it even if it’s already beyond the freshness date. Just make sure that it is stored properly so it won’t get contaminated in your fridge. Just like the other substitutes in this list, buttermilk is acidic, which is the key to being a great cream of tartar substitute. However, since it’s a liquid, you have to remove some of the liquids in your recipe. 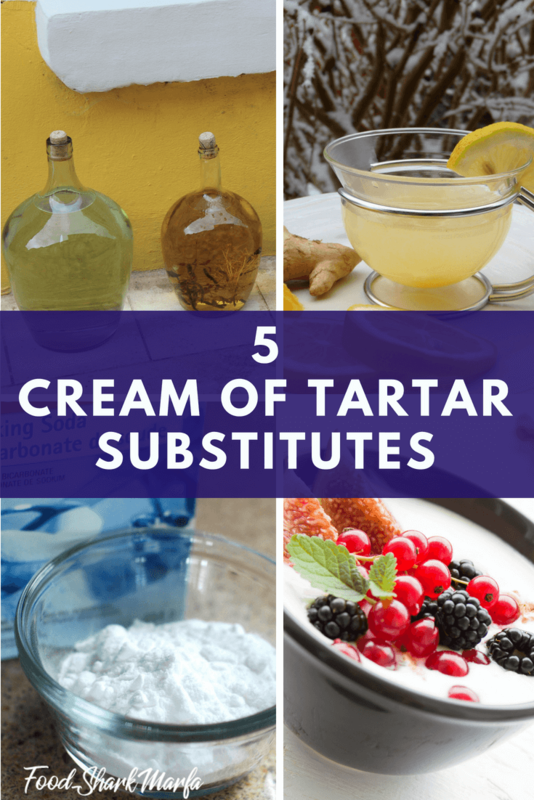 Cream of tartar is a very important ingredient in your recipe. You might be confused about which substitute on this list is the right one for you. The answer will vary and depend on which of these five substitutes is readily available in your kitchen. It can also depend on the kind of recipe you’re working on. But your best bet is white vinegar and lemon juice. This is because these two ingredients are acidic enough and they are very easy to find. Lemon juice and vinegar can also be used to stabilize egg whites. Meanwhile, your second best option is baking powder. This product is made up of baking soda and cream of tartar, which makes it a good option especially when you’re making something that has baking soda in it as well. Baking powder is followed by buttermilk and then yogurt. These two items are still great substitutes because they are also acidic but using them also means that you have to reduce your liquid ingredients. These last two options might not be recommendable for those who are still new to baking. Cream of tartar is a very useful kitchen ingredient. You can use it to bake your favorite goodies, but you can also use it to clean around the house. Because of this ingredient’s acidic properties, you will never run out of ways to use it. When you go out and buy cream of tartar in the groceries, you might have to buy it in a size that is bigger than what you actually need. Chances are, you don’t really have to use the whole box, so you’ll have to store the excess away for next time. To maximize the use of your cream of tartar, you have to know how to store it properly by putting it in a sealed container and avoid moisture from getting in. If you want to know if the cream of tartar that you stored is still okay to use, you have to check it carefully. Look for cracks or signs of moisture getting into the container. Using contaminated ingredients might ruin your cake or your baked goodies. You can also test the potency of your cream of tartar by mixing it with baking soda and warm water. If the mixture creates a foamy chemical reaction, then that means that your cream of tartar is still okay to use. But if it doesn’t, you can always buy a new one because it’s easy to find in the grocery stores. But if you are feeling lazy or you don’t have time to go out just to buy this ingredient, there are very reliable substitutes that you can try. The first one is white vinegar which is probably the easiest substitute that you’ll find. It is readily available in everyone’s kitchen because it is also used in cooking savory dishes. But more importantly, it’s an acid and it will react with baking soda as good as cream of tartar does. There are various kinds of vinegar out there but the best one to use as your substitute is white vinegar. It doesn’t have a color that might alter your finish product’s appearance. But you also have to be careful when using white vinegar as a substitute, since it’s not recommendable for some cakes due to its strong flavor, unless the recipe indicated that you can use it as a leavener. The second one is lemon juice. And you’ve probably figured out already why it’s a great sub. And yes, it’s because of its acidity level. Lemon juice is also used in a lot of ways at home just like cream of tartar. But it’s also a great stabilizer for your egg whites. You don’t have to worry if you’re half-way through making your meringue and you cannot find your cream of tartar! Lemon juice will do the job for you. The next substitute is baking powder. This is a common ingredient when you’re baking so you might have some stored in your kitchen cabinets. The composition of baking powder is cream of tartar and baking soda. If you’re recipe calls for both of these ingredients, then you can replace them by using baking powder. That’s killing two birds with one stone! Finally, yogurt and buttermilk are also great substitutes. If you don’t have the 3 other substitutes in your kitchen, but you have some yogurt or buttermilk in your fridge, then you can use them instead. A lot of people have these products because they are delicious and loaded with good bacteria. Now that you know the various kinds of substitutes for your cream of tartar, you’ll have more options when you are baking. Beginners also get to explore more and learn a lot about the basics because of these substitutes. It can be scary at first and you might fail a few times because you’ll have to get used with the measurements. But don’t let this discourage you. The greatest chefs and bakers also failed a lot of times before they finally created their masterpieces. Learn from your baking failures and make them motivate you to try again and keep going. The key is to keep practicing, and if you’re unsure of how you’ll substitute your cream of tartar, don’t be afraid to ask someone who you think is already an expert in baking. Most importantly, knowing and using these substitutes make baking more fun for everyone. Cooking isn’t supposed to be a boring task. It’s all about being adventurous, creating flavors, and crafting food that everyone will enjoy. Don’t let yourself get tied down because of recipe books. Get out of your comfort zone and try new things like substituting to improve your baking skills.